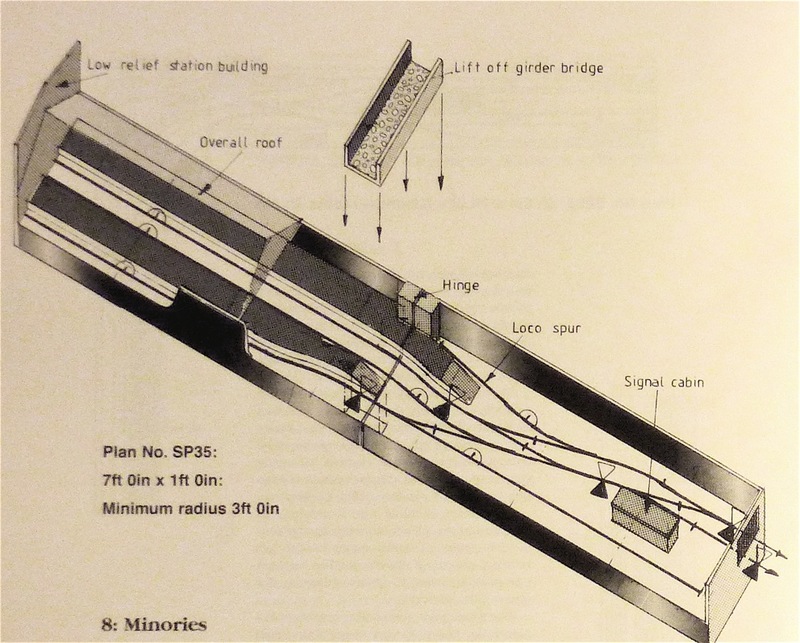 There are few model railway plans that can be deemed ‘classic’. One surely must be the late Cyril Freezer’s ‘Minories’ plan. The plan was the result a flash of inspiration whilst waiting for a train, then some doodling to try the recreate the Metropolitan station at Liverpool Street. The classic design that emerged was a three platform terminus. The terminal throat is an interesting pair of crossovers which mean that any movement only involves one reverse curve. Over the next few days, I would like to post on the ‘Minories’ plan and delve into variations of it. I’ve gathered a number of track layouts from RMWeb posts and other locations – I am not sure of the copyright on some of these, so I ask the owners patience if I post something I shouldn’t. 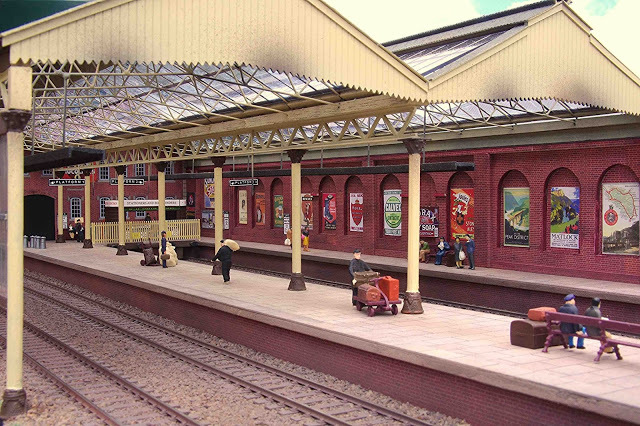 The original Freezer design was for TT gauge, to make use of the then new Triang ‘Jinty’ and suburban coaches. It was on a pair of folding boards, set in a cutting with retaining walls, like the original Metropolitan line. He later redrew the plan for OO and larger radius points, as shown below. The simplicity, yet charm, of the plan is clear…. Despite the simple track layout, an intense loco hauled commuter service would provide a lot of operating fun, especially with small tank engines and 4- or 6-wheel coaches. The kick-back siding wasn’t in the original design, and provides additional train storage, or room for a parcels or milk depot. Another of Freezer’s original Minories design had a two road parcels depot to the left of the platforms, linked to the kick-back siding. This would give more entertainment, but makes the layout wider. The narrow boards of the above design makes it look longer than it really is; this illusion is lost with a wider board. The basic track plan can be modified, but change it too much, it loses some of its original genius. Three bits of plan from RMWeb show some ideas. Add a third running track as below, and you have easier access to platforms 2 & 3. However, I wonder whether loop would be better as second loco spur, or as the parcels depot. Then it’s possible to add a loop, so that the kick-back doesn’t need a second locomotive to haul the train back out of the station. Perhaps better operationally, but I feel that it does lose a little of its big-city image. The strength of Minories is using basic pointwork to give a visually interesting and complex station throat. If you like making track, how about the layout below. 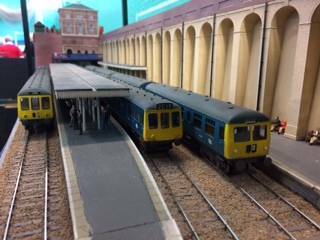 Note also the addition of the carriage sidings/parcels depot. Somehow this looks better than in the Freezer original, perhaps as the layout itself is longer, so the proportions still look long and thin. For comparison, here’s the layout of Marylebone, the Great Central Railway’s London terminus. If you simplify the four-track approach, it’s almost a Minories – even down to the milk dock next to the platforms. And this is the kernel of a Minories/Marylebone plan with large radius pointwork. A neat way of getting four platforms, but I miss the loco spur. Our layout is built in EM gauge, and our main compromise has been to slightly lengthen the points to give slightly more generous curves making the scenic area about a foot longer and 2″ wider than Cyril envisaged. This allows loco + 4 coach trains – a small reduction from the real thing. Whilst the over-bridges are ideal scenic breaks and joint-coverers, we have avoided the middle hinge device to allow for a deeper back scene, more accurate alignment and to make the boards more manoeuvrable. The baseboards are mainly plywood with some softwood to strengthen the corners. There is a 6-road traverser fiddle yard built from heavy duty filing cabinet sliders and more ply, which allows for a wide variety of trains. Operation is conventional DC control with Kaydee buckeye couplings. The second version comes from Australia, and can be found on Gav’s Workbench, Gavin Thrum’s site. It also appeared in the Railway Modeller in 2015. Whilst the MRC got rid of the hinged joints, Gav has hinged the fiddle yard to make the layout a single, foldable, unit. It’s a very fine variation on the classic Minories design. I note that in order to maximise the length of the fiddle yard roads, the station throat tracks are bi-directional. An acceptable ruse to save space, and I doubt whether you notice when operating. Next time, I’ll post on some variations to the basic Minories theme.